We are still over two months from the actual centenary of the birth of Witold Lutosławski (25 January 2013), but things are already hotting up. I, for one, am busy preparing copy for Belgium, Germany and the UK, and this morning I’m doing a telephone interview for the in-house magazine of the Witold Lutosławski PO in Wrocław. But by far the most intensive preparations outside Poland – so far – have been taking place in London for the Philharmonia Orchestra’s three-concert series at the South Bank Centre in January and March next year. The soloists are Krystian Zimerman, Truls Mørk, Jennifer Koh and Matthias Goerne. There are also three associated chamber recitals and one orchestral concert performed by students from the Royal College of Music. Most of the concerts place Lutosławski’s music alongside repertoire by other composers: Chopin, Szymanowski, Roussel, Ligeti and (principally) Ravel and Debussy. 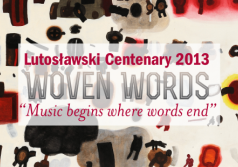 And that’s not all: the Philharmonia is taking parts of its Lutosławski programme – called ‘Woven Words’ after his piece Paroles tissées (1965) – to nine other cities between February and September 2013: Tokyo, Warsaw, Modena, Oviedo, Madrid, Dresden, Vienna, Ljubljana and Berlin. Full details of the programme and schedule may be found at http://woven-words.co.uk, but here’s a list of the pieces by Lutosławski that are being performed in London by the Philharmonia and the Royal College of Music. Philharmonia 30 January: Musique funèbre and Piano Concerto. 7 March: Cello Concerto and Concerto for Orchestra. 21 March: Symphony no.4, Les Espaces du sommeil and Chain 2. RCM 4 February: String Quartet. 6 February: Jeux vénitiens and Symphony no.3. 27 February: Two Studies and Bucolics. 6 March: Mini Overture, Fanfare for CUBE, Epitaph, Subito, Grave and Dance Preludes. The Philharmonia doesn’t do things by halves. There was a press launch in London in late October (unfortunately while I was in Warsaw), fronted by the two men whose idea this celebration has been: the conductor Esa-Pekka Salonen, who knew Lutosławski well and has long championed his music, and the composer Steven Stucky, the author of the eloquent Lutosławski and His Music (1981). The Philharmonia’s website http://woven-words.co.uk is a substantial achievement in itself, with a gallery of archival photographs assembled, special films made and essays written for the occasion. Salonen and Stucky travelled to Poland in the summer of 2012. The results may be seen in five contextually stimulating films in which they chart Lutosławski’s life and work, with archive stills and footage as well as a wealth of location shots (I liked the appearance of Blikle’s famous café in ‘World War II’!). Some of Lutosławski’s rarely seen manuscripts are discussed (especially in ‘Stalinist Years’) and there are excerpts from the music (the main footage being of the Concerto for Orchestra). Archive footage of the composer is also incorporated. The widow of Władysław Szpilman (The Pianist) appears in the third film, while Charles Bodman Rae (first two films) and Zbigniew Skowron (fourth film) also make telling contributions. The Philharmonia has commissioned five essays, which I understand will also appear in the programme book for the series (Steven Stucky’s insightful notes for the orchestral programmes are also presented in advance on the website). My own essay is also available on this site here.